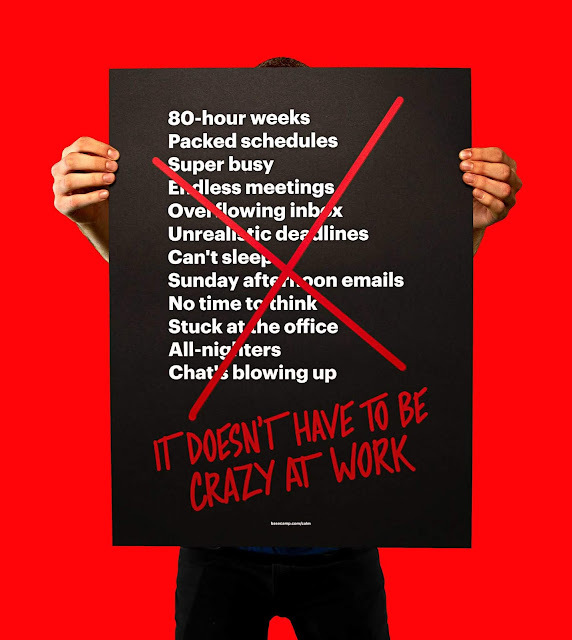 After "Getting Real" (2006), "Rework" (2010), and "Remote" (2013), last year Jason Fried and David Heinemeier Hansson published new book titled "It Doesn't Have to Be Crazy at Work". Both authors are the co-founders of Basecamp, previously 37signals, and the creator of the infamous web application framework: Ruby on Rails. Like their all previous books, there are a lot of great insights about how to run a company from them, although I don't agree at some points. This post is the summary lesson learned of their last book, which contain practices that are very insightful and also good reminders for me to run Suitmedia as a calm profitable company. A company is like software. It has to be usable, it has to be useful. And it probably also has bugs, places where the company crashes because of bad organizational design or cultural oversights. When you start to think about your company as a product, all sorts of new possibilities for improvement emerge. When you realize the way you work is malleable, you can start molding something new, something better. Whether you own it, run it, or “just” work there, it takes everyone involved to make it better. You can absolutely run a great business without a single "goal". You don’t need something fake to do something real. And if you must have a goal, how about just staying in business? Or serving your customers well? Or being a delightful place to work? Just because these goals are harder to quantify does not make them any less important. Your time in the office feels shorter because it’s sliced up into a dozen smaller bits. Most people don’t actually have 8 hours a day to work, they have a couple of hours. The rest of the day is stolen from them by meetings, conference calls, and other distractions. So while you may be at the office for 8 hours, it feels more like just a few. When you cut out what’s unnecessary, you’re left with what you need. And all you need is 8 hours a day for about 5 days a week. You can’t expect people to do great work if they don’t have a full day’s attention to devote to it. Partial attention is barely attention at all. Effective > Productive. When people focus on productivity, they end up focusing on being busy. Filling every moment with something to do. And there’s always more to do! Being productive is about occupying your time—filling your schedule to the brim and getting as much done as you can. Being effective is about finding more of your time unoccupied and open for other things besides work. Time for leisure, time for family and friends. Or time for doing absolutely nothing. I really do regret ever using the word “productive” when referring to my efforts or anyone else’s efforts. Being productive is not a noble goal or pursuit. Being effective is. That’s not a function of output or time, it’s a measure of impact. A great work ethic isn’t about working whenever you’re called upon. It’s about doing what you say you’re going to do, putting in a fair day’s work, respecting the work, respecting the customer, respecting coworkers, not wasting time, not creating unnecessary work for other people, and not being a bottleneck. Work ethic is about being a fundamentally good person that others can count on and enjoy working with. Work ethic has a lot more to do with showing up on time and being reliable than it does working 80 hours. Work doesn't happen at work. People aren’t working longer and later because there’s more work to do all of a sudden. People are working longer and later because they can’t get work done at work anymore! If I can write you quickly, you can get back to me quickly, right? Technically, right. Practically, wrong. If someone doesn’t get back to you quickly, it’s not because they’re ignoring you—it’s probably because they’re working. Don’t you have some other work to do while you wait? You can’t credibly promote the virtues of reasonable hours, plentiful rest, and a healthy lifestyle to employees if you’re doing the opposite as the boss. If you, as the boss, want employees to take vacations, you have to take a vacation. If you want them to stay home when they’re sick, you can’t come into the office sniffling. Don't cheat sleep. Get a good eight hours every night, even when you’re first getting started. Those hours will not be wasted. A great night’s sleep enhances every waking hour. In the long run, work is not more important than sleep. Few things in business are as stressful as realizing you hired the wrong person. Great people who are eager to do great work come from the most unlikely places and look nothing like what you might imagine. Focusing just on the person and their work is the only way to spot them. Ignore the talent war. It’s not a fixed, scarce resource that either you have or you don’t. Someone who’s a superstar at one company often turns out to be completely ineffectual at another. It takes patience to grow and nurture your own talent. But the work it takes—tending to the calm-culture soil—is the same work that improves the company for everyone. Library Rules. Walk into a library anywhere in the world and you’ll notice the same thing: It’s quiet and calm. Everyone knows how to behave in a library. It’s a place where people go to read, think, study, focus, and work. Isn’t that what an office should be? Look, open-space offices may be necessary for some companies, if they can’t afford private offices. But don’t dress up such a compromise as “good collaboration”. Just apologize to workers for subjecting them, allow remote work to escape it, and commit to Library Rules within. When it comes to chat, we have two primary rules of thumb: “Real-time sometimes, asynchronous most of the time” and “If it’s important, slow down.” Important topics need time, traction, and separation from the rest of the chatter. If something is being discussed in a chat room and it’s clearly too important to process one line at a time, we ask people to “write it up” instead. This goes together with the rule “If everyone needs to see it, don’t chat about it.” Give the discussion a dedicated, permanent home that won’t scroll away in five minutes. Email got so many things so right that we're still unpacking its brilliance four decades later. Long-form and asynchronous, email is an ace medium for fully considered thoughts. Not knee-jerk, instant reactions. We lost sight of that due to chaff. What we do repeatedly hardens into habits. The longer you carry on, the tougher it is to change. All your best intentions about doing the right thing “later” are no match for the power of habits. Later is where excuses live. Later is where good intentions go to die. Later is a broken back and a bent spirit. Later says “all-nighters are temporary until we’ve got this figured out.” Unlikely. Make the change now. Like personal habits, company habits are formed early and hard to break. The early days - under 10 people - are the most important. Being clear about what demands excellence and what’s perfectly okay just being adequate is a great way to bring a sense of calm into your work. You’ll worry less, you’ll accept more. Knowing when to embrace "Good Enough" is what gives you the opportunity to be truly excellent when you need to be. Best practices are like training wheels. When you don’t know how to keep your balance or how fast to pedal, they can be helpful to get you going. But every best practice should come with a reminder to reconsider. Find what works for you and do that. Create your practices and your patterns. Who cares if they’re the best for anyone else. For every “best practice”, there’s a time when the opposite approach is superior. Once you stop looking for such openings, you stop growing. And plenty of “best practices” are either cargo-culted from a different time, language, or domain, and no longer service progress. We don’t need to shoot up on risk to get excited about work. We’ll take a risk, but we won’t put the company at risk. Taking a risk doesn’t have to be reckless. You’re not any bolder or braver because you put yourself or the business at needless risk. The smart bet is one where you get to play again if it doesn’t come up your way. Crazy’s in the red. Calm’s in the black. You can easily go broke generating revenue—many companies have. But you can’t go broke generating a profit. Profit means time to think, space to explore. It means being in control of your own destiny and schedule. Without profit, something is always on fire. When companies talk about burn rates, two things are burning: money and people. One you’re burning up, one you’re burning out. Which tech/business conference is going to host the “A step-by-step guide to losing a billion dollars a year!” panel session? The Uber and WeWork CEO’s would make good panelists. Who’s the third? The worst customer is the one you can’t afford to lose. The big whale that can crush your spirit and fray your nerves with just a hint of their dissatisfaction. These are the customers who keep you up at night. Becoming a calm company is all about making decisions about who you are, who you want to serve, and who you want to say no to. It’s about knowing what to optimize for. If you want to know the truth about what you’ve built, you have to ship it. You can test, you can brainstorm, you can argue, you can survey, but only shipping will tell you whether you’re going to sink or swim. You can iterate from there on real insights and real answers from real customers who really do need your product. Launch and learn. Startups are easy, stayups are hard. Keeping the show running for the long term is a lot harder than walking onstage for the first time. On day one, every startup in the world is in business. On day one thousand, only a fraction remain standing. That’s reality. So pace yourself. Don’t burn out early thinking the hard part is behind you. People don’t like to have their grievances downplayed or dismissed. When that happens, even the smallest irritation can turn into an obsessive crusade. Everyone wants to be heard and respected. It usually doesn’t cost much to do, either. And it doesn’t really matter all that much whether you ultimately think you’re right and they’re wrong. Arguing with heated feelings will just increase the burn.